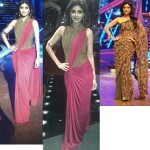 Week 5 of Nach Baliye 6 – Shilpa Shetty tweeted this pic of her from the set of Nach Baliye. She is looking ‘Super Se Uperrrrr’ gorgeous in yellow sari with that innocence on her face. She’s wearing a Surily Goel saree with Anmol jewels and partly tied hair straight hair. 100/100 marks to her! She always looks pretty in traditional Indian outfits.